I am starting this one up a little early this week because I like the design so much personally. Some of you have asked for a Solstice coupe shirt, and this one will be for sale through next weekend. Please remember that the other solstice shirt has only a few days left. Shipping is combined on all purchases, so maybe pick up both! Remember that long sleeve tees and hoodies are available too. Thanks! What is the second image ? Is that on the back ? Thanks! No the 2nd image is just a closeup of the car. Any chance of doing the Coupe in black? But the close up is different, it has the text ANALOGCAR. Does the shirt have that text on the front like that ? Thanks for the question. Honestly that all depends on how well this shirt does. There aren't many coupe owners out there, but I think this is one of our better graphics so hopefully it sells well. I wouldn't recommend waiting for specific colors though. Sorry I can't do every color! I own a coupe and like the design (best angle).. but do you have a darker shirt to put it on? Is that white on white? Hello. Yes it's a white car on a white shirt, but there is a lot of light gray in the actual graphic and it actually shows up quite well. Unfortunately I can only do one color at a time. I may bring this design back in a different color if does well though. I'm quite partial to coupes and I'm proud of this shirt. I'm also jealous of your car! 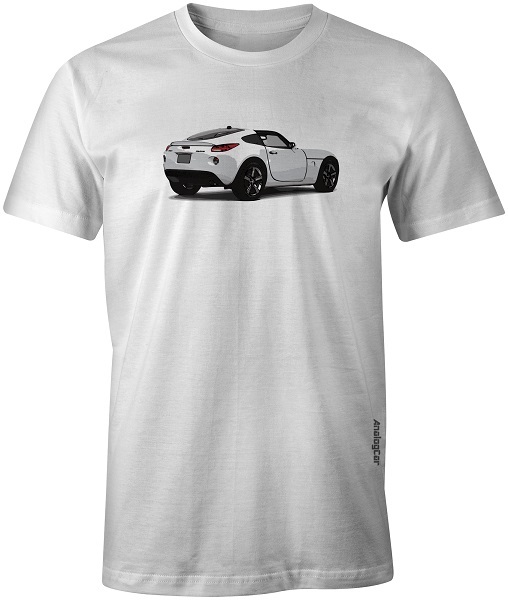 Just an FYI, so far the white Solstice coupe t-shirt is getting significantly less orders than the gray Solstice convertible shirt. Unless that changes, I think the market is really telling me that it wants convertible shirts only, so I might do one more color of that plus a Sky shirt. That being said, today is the last day for the gray convertible shirt! Just ordered a long sleeve coupe shirt. Thanks for making these. If you do a Solstice GXP yellow roadster one I will step up for one. Question for you..... your hoodies....I assume no zipper down the front? I find I get too hot without a zipper. If you can do a hoodie with artwork on the back and zipper in front then I am in. ......….I think the market is really telling me that it wants convertible shirts only, ……………. Remember that of all Solstice production not even 2% was Coupes. Thank you! Yes, the hoodies are the classic hoodie with no zipper; it has pockets in the front. I will look into the potential of a zipper in the future. I haven't decided if we will be doing a yellow car yet. Who else wants a yellow Solstice?? If you don't, what color do you want? I know we have one vote for red, yellow, and green each. Extra points if the graphic is on BOTH side of the t-shirt, and the t-shirt comes in contrasting colors. WickedMike and TVRBill like this. I did check into the zipper hoodie and my printer cannot do them at this point. Sorry! Contrasting colors is something that we sometimes do, and I appreciate the suggestion. As far as printing on both sides, we don't do that because it increases the price of the shirt by about 50 percent. Thanks!